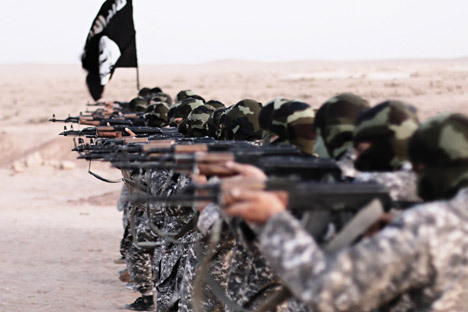 ISIS masked militants firing weapons. A court in Yekaterinburg sentenced a recruiter from a Syrian terrorist group to 39 months’ imprisonment on December 8. Earlier, the Russian Civic Chamber opened a hotline for relatives of recruits to call and help authorities trace and track potential terrorists. While radical Islamist groups become increasingly effective in recruiting ordinary Russians to their cause, the state is increasing efforts to identify those at risk of falling for the ideology of such recruiters. A court in Yekaterinburg (around 1,100 miles east of Moscow) judged that city resident Mohammad Gireyev actively used social networks to recruit potential supporters for the Jaish al-Muhajireen wal-Ansar group. This organization was earlier linked to the Islamic State jihadist group and is now affiliated with another terror group, the al-Nusra Front. Russia actively began looking for terrorist recruiters and recruits after the widely-publicized incident involving Varvara Karaulova, a Moscow student who travelled to Turkey to enter Syria and join ISIS after being contacted by recruiters. She was detained near the Syrian border and sent back to Russia. The mass media later started reporting, with increasing frequency, on children from well-to-do families and regions with no Islamic underground who had set off for the newly-proclaimed caliphate, after meeting recruiters on the internet. As ISIS grew it became apparent that recruiters would work not only with Muslims, but any vulnerable citizen. "The people who call or write are those who suspect relatives of sympathizing with ISIS and ask to have them returned from Syria," she said. Having received and verified information on a person who has gone to Syria, Sutormina's colleagues then write to the Interior Ministry and Russia’s Federal Security Service (FSB) asking that an international search warrant be put out for the individual. They also ask government authorities to help look for the relative if he or she has still not left Russia. A recent case involved a car dealership in a Moscow suburb, said Sutormina. Volunteers were trying to fight recruiters unofficially, Sutormina said, with the internet expanding the geography of alarming signals. The service can now block sites only if the General Prosecutor's Office orders it. Meanwhile, Russia’s parliament, the State Duma, is trying to toughen anti-terrorism legislation, including reviewing proposals to make punishment for recruitment harsher. Russia’s North Caucasus is reportedly now the main supplier of ISIS recruits. The figures differ, but the FSB and the National Anti-terrorist Committee say that there are at least 4,000 Russian citizens on ISIS-controlled territory, who are mostly of North Caucasus origin. "Of course, many prefer just to take their family and go to Turkey for starters. From there you can get over the border to Syria. The difference is that you can't take your family into a forest, while ISIS needs not only soldiers but also people with other professions. You can actually live there," said a Moscow-based Salafi preacher, who spoke to RIR on condition of anonymity.